As a member of a busy wedding band from Northern Ireland, the Christmas and New Year season is such a busy little period. It is fantastic getting to see so many wedding venues throughout the country all decked out for the holidays These photos were taken at a wedding in the Europa Hotel in Belfast. This is a very popular venue for brides and grooms throughout Northern Ireland and it really is quite spectacular at Christmas. Remember, we are taking bookings right in to 2017. 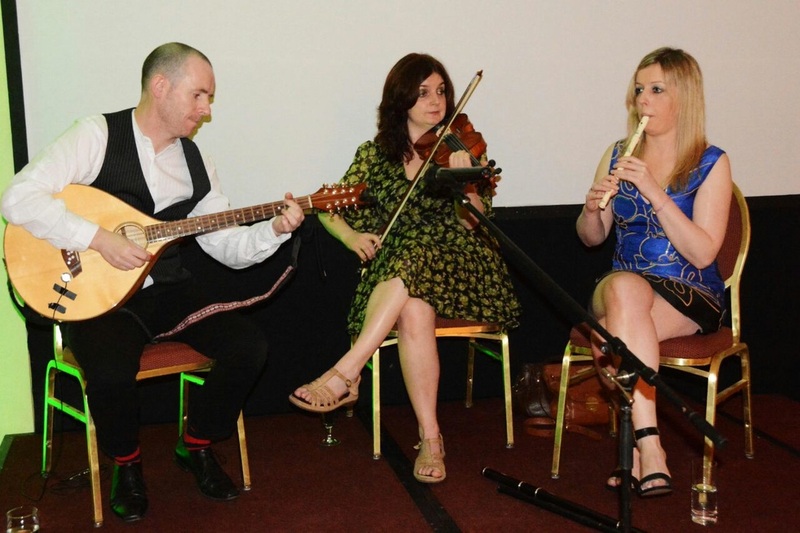 Trinity Traditional Trio perform a fusion of classical, contemporary and Celtic music. We are a unique band, as not only are we musicians but singers also and so allow a lot of flexibility for your big day. Check out our videos on our 'listen' page to have a look at what we can offer you. A very happy 2016 to you all! 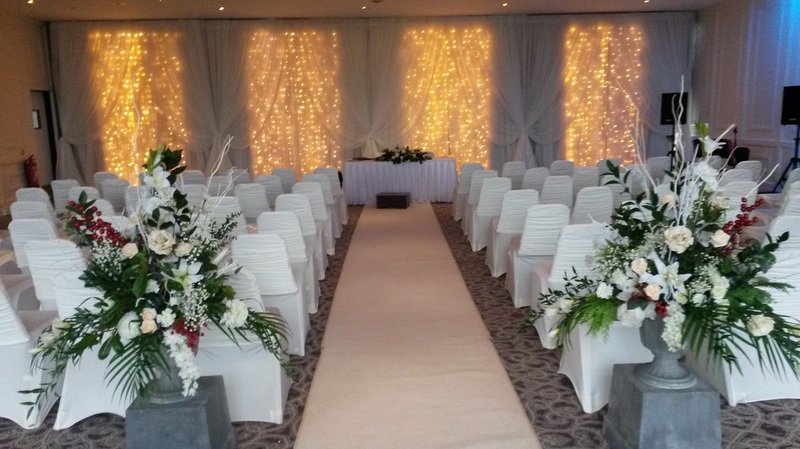 This will be the year when many of you get married, so if you are having a wedding ceremony around Belfast or Northern Ireland, why not consider having us as part of your big day? We guarantee a professional and reliable service and will make sure we tailor the music for your special day. Our unique blend of Celtic, contemporary and classical music will ensure all tastes are catered for. We are available for your wedding ceremony and drinks reception. Get in touch asap to guarantee availability. Happy New year from Wedding Band, Northern Ireland! 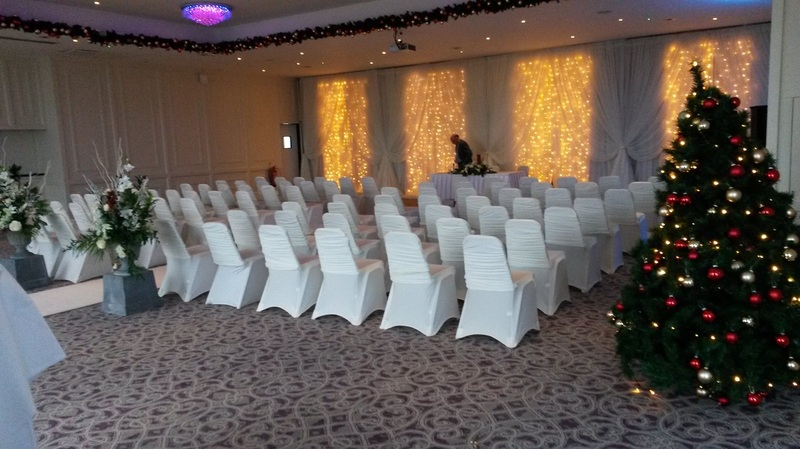 Remember, if all members of Trinity Traditional Trio are not available, we have a wide pool of wedding musicians and wedding singers available to perform along with us to make sure your big day is very special. Happy Christmas to all our brides and grooms! Trinity Traditional Trio just want to say a big thank you to all the brides and grooms who have asked us to be part of their wedding day during the last year. It is always a privilege to be asked to share that with you and we hope that you have enjoyed your first Christmas together! For those of you whose weddings we will be performing at over the coming years, we hope you had a fantastic Christmas with the anticipation of the year ahead! Lol. ​Remember, we are taking bookings for 2017 and the diary is filing up. We offer music for the ceremony, drinks reception and can perfrom session style or amplified. Check out our prices page for the packages available. Thedandyhorses Jo , Marty Malone, Thedandyhorses & Co, worth a listen! This wedding band from Northern Ireland were so lucky to lead this fantastic Irish session at a wedding ceremony in the Ballygally, Northern Ireland a week or two ago. Our own Joanne Cassidy was getting married and after performing at her wedding ceremony we all headed up the coast to perform at the drinks reception. You can even see her playing at the session in her wedding dress! If you fancy something similar at your drinks reception... get in touch! Wedding for one of our trio! Wedding Band, Northern Ireland celebrate marriage of one of their members! This weekend, our very own wedding singer, Joanne got married! And guess who she chose as her wedding band from Northern Ireland?? Us!!!! Trinity Traditional Trio! It is always a privilege to be asked to perform at a wedding ceremony or wedding reception and especially when it is such a good friend. Joanne has been performing at weddings for many years now,, and so we had our work cut out for us. Lol. We were joined by other musicians from Northern Ireland, Rodney McKinney from The Dandy Horses and a fantastic piper, Buzz. Not only did we perform at the ceremony, but we also had a rocking session before the drinks reception in the Ballygally, Northern Ireland. A great day and a massive congratulations to Jo and her husband, Marty. Northern Ireland wedding band in Ethiopia! The three musicians from Trinity Traditional trio were very privileged to travel to Ethiopia last St Patrick's day to perform for the British and Irish ambassador at the annual St Patrick's Ball in Addis Ababa. We love performing at wedding ceremonies all over Northern Ireland, but this was something totally different! We had an absolute ball! I found this little picture of us playing at the Irish session before the ball kicked off and we joined the other members of The Dandy Horses on the huge stage and watched the guests dance the night away! Such a beautiful hymn! I only recently discovered this hymn very recently, when a bride asked could we perform it at her ceremony. It is just lovely when you find an undiscovered gem and this really is a perfect wedding hymn. As alwats, Trinity Traditional Trio put our own little spin on it. We managed to get a recording of it at a chapel on the Ormeau Rd in Belfast. You can check it out on our listen and watch page. You can hear the beautiful voice of Joanne Cassidy with myself on harmonies and violin. The talented Sean Quinn also adds so much with his mandolin. ​Don't forget we are taking bookings for 2017 now. Don't miss out! It can be very difficult to know how to reach new clients, brides and grooms, in this day and age. We have put together our website, set up a Facebook page and arranged to have a profile on Twitter. However, it is still hard to reach potential clients. We have attended Perfect Bliss Fairs in the past. We went to a fantastic Fair in Lisburn Civic Center last year. However, we still feel that our best marketing tool is the internet. With life being so busy, the easiest place to look for something is on the internet. But as a band working in the wedding industry it can be difficult to get your website to the top of the list. We can pay for ad-words and other advertising, but the golden key, is to reach page one of google! If you have any other suggestions, please let us know! In the mean time, remember we are now taking bookings for ceremonies in 2017. 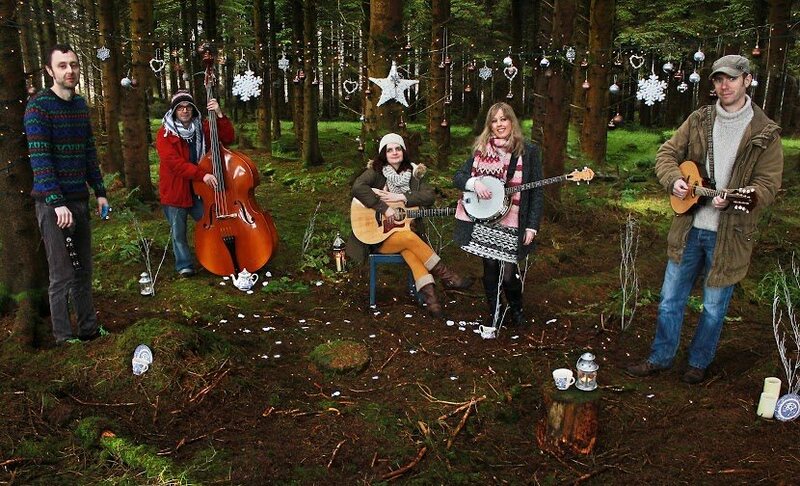 The three members of the Northern Ireland wedding band Trinity Traditional Trio are also members of the highly acclaimed folk group The Dandy Horses. This time last year we were busy performing at wedding ceremonies and drinks receptions throughout Northern Ireland, as well as getting ready to release our Christmas single 'A Winter Waltz'. Christmas is such a lovely time of the year and winter can also be a fantastic time to get married. Have a little look at one of the photos we took during our photo shoot last year.